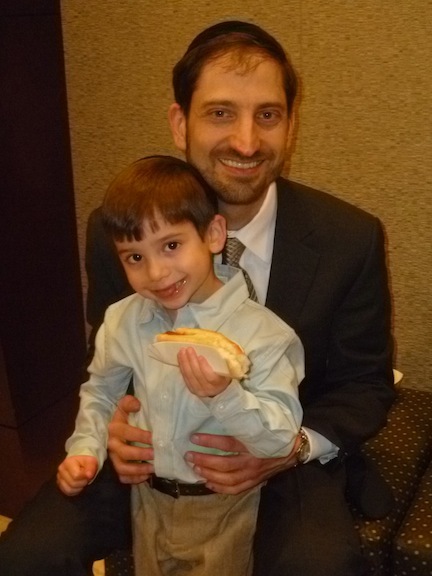 My deprived 4-yr.-old is thrilled to have scored a hot dog at a bar mitzvah. A friend asked this week, after I posted my Something from Nothing stew, what’s my secret to getting my kids to try new foods. I can’t say that I have any brilliant ideas other than to start them while they’re young (check out Granola Baby’s first eats) and make them try dinner before offering an alternative. Our rule is that everyone has to try the dish, even if they’ve had it and didn’t like it in the past. The kids who don’t like the food go get their own bowl of cereal. My older girls gobble down dinner and never are afraid to try new foods, but my 4-year-old is a tough customer. Still, I’ve managed to get a few foods other than cereal and snacks into his mouth. Here’s the first in a series of healthy dinner foods that my 4-year-old will eat. Mix the oil, spices, salt and garlic in a large bowl. Add the cauliflower and stir to coat. Roast on a pan at 425 degrees for 20 minutes, until lightly brown. We should have given him a hot dog when the professional photographer was trying to make him smile! keep one in your purse for next time!